Split a single outdoor faucet into four individual spigots. 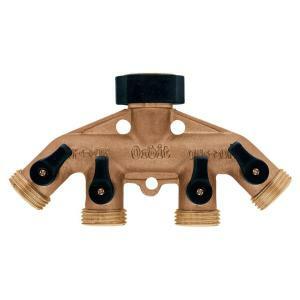 These are perfect when you have drip systems and still want access to your spigot for a garden hose. Individual shutoff valve for each hose connection. Durable solid brass construction. Includes mounting bracket and hardware for securing in place as multiple items on one spigot may be cumbersome.